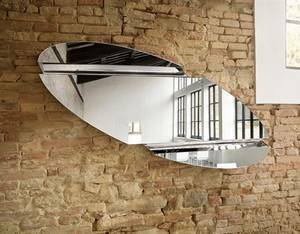 Description A stunning modern wall mirror consisting of 2 curved sections in silvered glass and 3 flat mirrors bonded together. A rear mounting panel allows the mirror to be hung in a variety of positions. Available in 4 shapes: oval, elliptical, rectangular, or recatangular with a pointed corner (shown in images). ‘The Wing’ is a collection of mirrors by renowned designer Daniel Libeskind. ‘The Wing’ is available in 3 different shapes all containing sections of curved silvered glass, and can be hung in a variety of positions. The theme of energy and light is also present in the architectural designs of Daniel Libeskind. ‘The Wing’ has certain design similarities as the extension to the Royal Ontario Museum in Toronto (see image below) also designed by Libeskind.